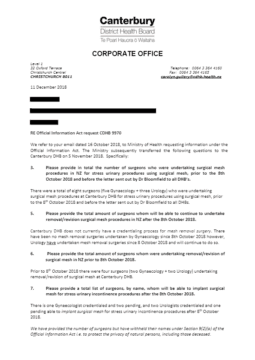 Please provide in total the number of surgeons who were undertaking surgical mesh procedures in NZ for stress urinary procedures using surgical mesh, prior to the 8th October 2018 and before the letter sent out by Dr Bloomfield to all DHB’s. Please provide the total amount of surgeons whom will be able to continue to undertake removal/revision surgical mesh procedures in NZ after the 8th October 2018. Please provide the total amount of surgeons whom were undertaking removal/revision of surgical mesh in NZ prior to 8th October 2018. Please provide a total list of surgeons, by name, whom will be able to implant surgical mesh for stress urinary incontinence procedures after the 8th October 2018. Please provide a list of surgeons, by name, whom will be able to remove surgical mesh for stress urinary incontinence procedures. (major removal 2nd or subsequent adjustment as set out in credentialing expectations). Also see OIA response 9970a for further information.